A Hamilton Beach steam iron boasts a comfortable design that allows for perfect pressing. Its high-power steam system also provides fast and effective vertical steaming for quick touch-ups. The water reservoir, which comes with a hinged fill-hatch and a translucent design, makes it easy to see when more water is needed, and the temperature control and steam knob puts you in control of the steam output. 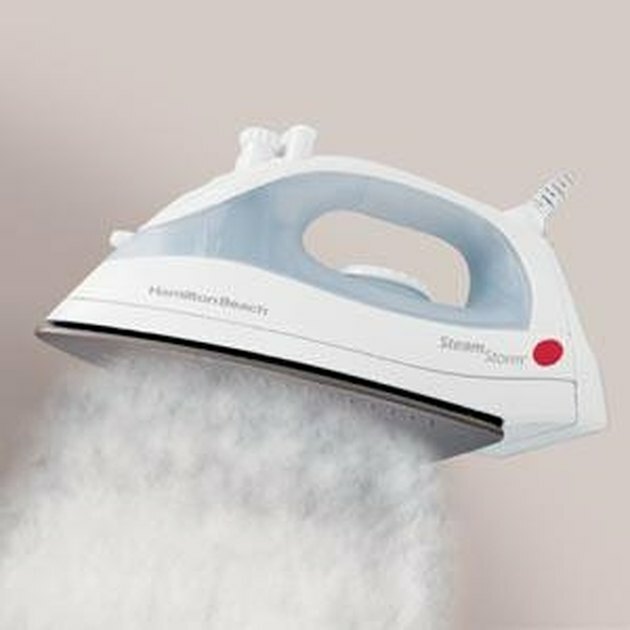 Another great feature of Hamilton Beach steam irons is the self-cleaning feature which makes it easy to steam out any buildup from inside the iron. Turn the temperature control to the "Off" position. Unplug the iron from its electrical outlet. Fill a measuring cup with cold tap water. Open the water fill cover. Pour water from the cup slowly into the iron’s water tank until the water level reaches the 1/2-full line. Close the water fill cover. Set the iron on its heel rest. Plug the iron into a working electrical outlet. Set the steam on/off control to the "O" position for "Dry Iron." Set the temperature control to "Linen." Allow the iron to heat up for 2 minutes. Turn the temperature control to the "Off" position. Unplug the power cord from the electrical outlet. Lift the iron by the handle and hold it horizontally over the sink with the soleplate facing down. Press and hold the "Self-clean" button on the top front of the handle to release boiling water and steam from the steam vents. Hold the "Self-clean" button until all of the water drains from the iron. Rock the iron gently from front to back to allow the steaming water to clean the entire soleplate. If water still remains in the soleplate repeat Steps 3 and 4. Set the iron on its heel rest and allow it to cool completely. Wrap the cord loosely around the handle of the iron and store in an upright position. The steam iron should always be turned to the "Off" position before unplugging or plugging it into an electrical outlet. Use only tap water in the steam iron. Never fill the iron by holding it under a water faucet. Never submerge the iron in water. Never allow the hot soleplate to come into contact with delicate fabrics. Never allow the iron to rest on the hot soleplate. Steam irons operate at extreme temperatures and can cause serious burns. Use caution when handling any steam iron.